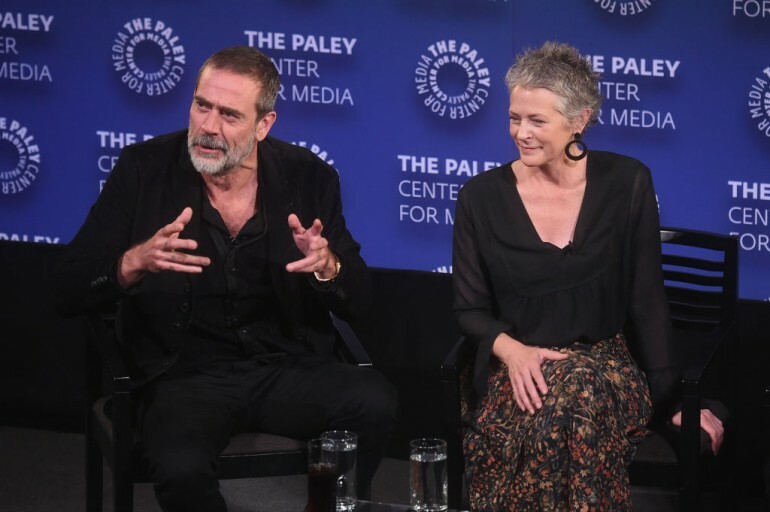 Will ‘The Walking Dead’ Season 9 Finale Feature Carol And Negan Vs Alpha? While a bloodbath has been teased even before “The Walking Dead” Season 9 premiered, nothing prepared fans for the shocking deaths in Episode 15, “The Calm Before.” Some people seem to think that the worst part is over. But the group is now expected to hatch a plan for retaliation, and many believe that this will involve Negan. How likely will this come to pass? There's no denying that Carol is hell-bent in making Alpha pay for what she's done. It would be a surprise if there wasn't a showdown between her and the Whisperer leader. Alpha, as Debbie, even told Ezekiel at the fair that she can't wait to meet the queen, which now feels like more of a call-out to her than just a way to convince the king that she was one of them. Meanwhile, the promo for the finale shows that Carol has no plans of playing by Alpha’s rule. Their similarities — both being mothers with a violent streak — will make for an interesting confrontation. While “Savage Carol” can definitely take out the Whisperers by herself, some say she will get an unexpected help. The majority of comic book fans predict that this person is Negan. So far, the former Savior leader missed out on all the fun and mayhem being back in his cell, but this could change soon. As per speculations, Negan will help the group defeat the Whisperers, perhaps as a response to the desperate call of the communities to take down such vicious threat. Perhaps even Carol will look to him for assistance if Daryl doesn't back up her play and sides with Ezekiel, which speculators seem to think so. After all, Beta is still around, and he is not going to be easy to take down. Promotional stills for “The Walking Dead” Season 9 finale, “The Storm,” also show Negan out of his cell. He is in some sort of a cabin, along with Gabriel, Siddiq, Rosita, Eugene and Judith. It is unclear where this place is, but it might be somewhere in Alexandria. From the looks of it, Judith may have convinced the others to bring Negan with them to safety because they can't just let him freeze to death. Spoilers for “The Walking Dead” comic book below! At this point in the story, it wouldn't make sense for Negan to have a beef with Alpha and be the one to kill her as he did in the comics. He wasn't really even at the fair. However, some people imagine that he would be pretty mad about his former wife, Frankie, getting piked. But it might not be enough reason for him to be the one to give the death blow to Alpha. However, in the comics, he does get to take a shot at Beta. That conflict hasn't been set up yet, though. Beta is such a terrifying force that Daryl might need a hand when they meet again for a rematch. For now, what he can bring to the table, “The Walking Dead” fans believe, is getting into Alpha's twisted psyche. Both his and Alpha's violent murders were — from their perspectives — actions they were forced to make as leaders. They were retaliations, a show of force and a way to protect their people. So if anyone can get into the state of mind of a brutal leader like that, it's him. In turn, he might get his freedom in exchange for his assistance in the war. Whether or not this will be the case, fans won't have to wait that long. “The Walking Dead” Season 9, Episode 16, “The Storm,” airs Sunday, March 31, on AMC.